Are there also analytics than can let teams know, in advance, that a project is likely to fall behind or fail? Emotions matter and teams need to have some form of empathy. Not something software is generally good at, so we need to find ways to compensate for this. In addition to the points raised by Steven is research from Harvard, MIT and others, pointing to the fact that 10 - 40% of team performance is determined by psychological factors such as empathy, relational cohesion and the nature of interpersonal communication. Predicting team performance is important and psychological factors are one approach that show promise. Using 4G and the Visual Team Builder (VTB), it's possible to predict how specific Social Relationships between two people will unfold and in turn, aggregate this data to look at team relationships, complex group dynamics and to see their impact on team performance. Before examining the diagrams below, it's worth adding some context and background. The data collection process in order to create the diagrams is quick, taking around an hour per person and is explained in more depth here. In addition, the diagrams from the VTB can be used to both predict the nature of specific Social Relationships amongst team members who have never met before and also used to analyse team dynamics amongst existing groups who are already working together. In essence, the VTB lends itself as a tool to predict team performance, aid team creation, and enhance decision making and organisational design issues, along with providing coaching and developmental tips to enhance performance amongst existing team members. In the first diagram, it is possible to see how the VTB highlights the nature of the different Social Relationships within teams 1, 2 and 3. 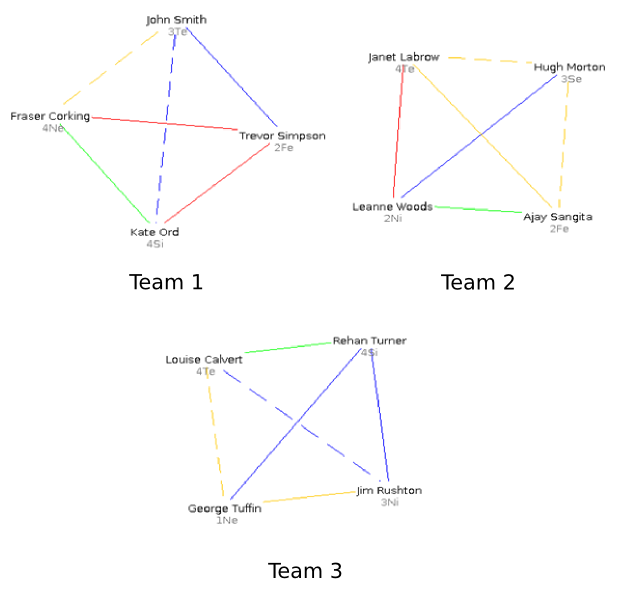 Based on a quick assessment of the diagram1, team 1 presents the greatest challenges given the red relationship lines between Fraser and Trevor and Kate and Trevor. Likewise, team 2 has 1 red and 3 yellow lines, meaning that 4 relationships from 6 are going to require high levels of time and energy in order for these particular relationships to function productively. Of the 3 teams, team 3 has the most productive relationships and all things being equal, this would be the team that would be expected to display the highest level of performance. By way of comparison, teams 4, 5 and 6 tell a different story. Firstly, team 4 is likely to be the best performing team amongst all 6 teams. This is due to the fact that this team comprises of 6 green relationships between all 4 team members. Secondly, the three teams below all comprise the same people as the three teams above. In other words, by using the predictions available from 4G, it is possible to optimise the team creation process such that the best possible relationships are experienced by all team members. 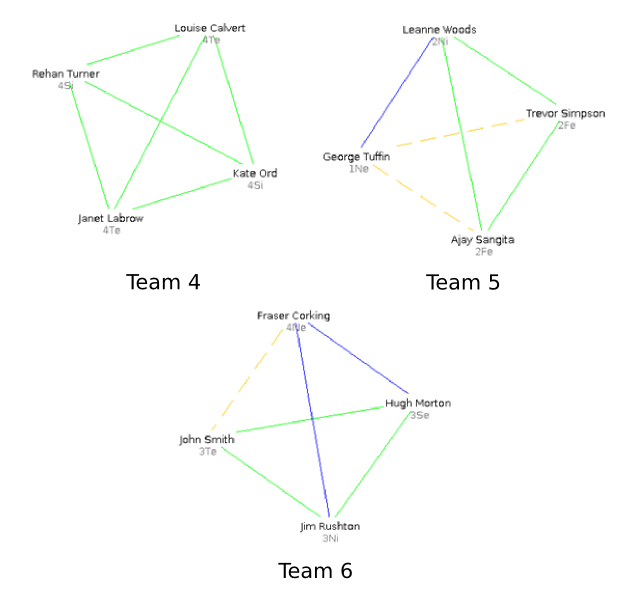 In turn, this illustrates how 4G can be used to predict team dynamics, even before team members have actually met one another. By using 4G as a guide to group dynamics, along with incorporating it's relationship predictions into team creation, organisational design and related processes, 4G offers a unique approach to both understanding and enhancing engagement levels, business outcomes and team performance. 1. The visual information from the Visual Team Builder diagrams presents a very high level summary of the team dynamics in question. In order to gain a richer picture, an analysis of the Social Profiles, Social Relationships and Social Groups in each team would need to be undertaken. This information is also available from the VTB and associated reports but is not captured in the diagram. It is also important to state that the diagrams above don't take skills or context into account e.g. tasks, experience, responsibilities or the organisational hierarchy into account. This information is available from other sources and is easily combined with the data from the VTB in order to create a full and comprehensive understanding of the scenario in question. This entry was posted in 4G, Psychology, Relationships, Tools and tagged Analytics, Group dynamics, Nugg, performance, physics of people, prediction, team performance, teams. Bookmark the permalink. 8 Responses to "Can You Predict Team Performance?" Fascinating. Thank you. We will have to think about this as we design future versions of http://nugg.co I wonder how these dynamics change over time. Hi Steven – many thanks for your comment. It would be good to find out more about Nugg to see if there is any overlap or to explore how Nugg and 4G might complement each other? Is it worth speaking at some point? Re: the dynamics changing over time – we find that broadly speaking, the dynamics stay the same. They are consistent enough for the diagrams and output from 4G to hold for the long term, hence the comments about consistency and repeatability. That said, coaching and development always helps and can facilitate people being able to improve their own relationships. If one applied that individual development to the diagrams, there would be many more shades of the colours. For example, the red line would vary from a deep red/purple to a very light pink, while the blue would also vary from dark blue, through to a light blue and then a sky blue. I hope that makes sense? You can predict the performance of teams by measuring social sensitivity. A simple test is to observe meetings and measure how balanced the conversation is. If 10% of the people dominate 90% of the discussion, it is unbalanced, and it means that other views concerns and opinions are not being heard. That is one of the predictors of poor team performance. Contrapositively, you can improve team performance by adding team members with high social sensitivity. Hi Stowe, I remember reading about this a while ago. I thought it was a good piece but one that was somewhat tricky (but not impossible!) 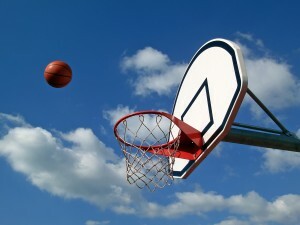 to turn into practice…. For example, is a dominant person dominant in multiple teams and to the same degree? Is the dominant person the team leader and if so, does this raise questions about their own style of communication? How quickly can one establish communication levels in a newly formed team when people haven’t met for the first time? How easy is it to re-balance social sensitivity in a team? It’s also interesting because it seems to me that the bottom line in this is all about listening more and talking less – the kind of advice that is given very easily to children but that is seldom said to adults… I wonder how it would be received in a training or coaching session, not least by those with a ‘Type A’ personality? Have you had any experience with these themes in social sensitivity at all? That’s exactly the issue. Adding brainiac Alphas to a small team decreases performance. Full stop. If those folks become self-aware — by reflection or behavior modification — they can learn to listen more. Have you looked at Good.co? Hi Stowe, interesting you should mention brainiac Alphas – this was exactly the problem Belbin set out to solve in this research in the 70’s and from memory, this was the starting point of his research and first book Management Teams. I think this problem is still trying to be resolved today. I’ve come across Good.co – yes – it reminds me of a mixture of MBTI with the archtectypes, plus the use of some internal norm groups to create the workplace fit score, although it’s not clear if the scores for the 400 companies came from internal staff or not? The fitscore with other people and jobs looks a little like the Work Pair Analysis and Job Analysis from Extended DISC. The 15 questions are also interesting – there’s been some work on developing very short psychometric instruments over the years, but I don’t know how well they are received. The screenshot from the site suggests an ipsative questionnaire, but I may be wrong about that – Good.co aren’t too forthcoming about their validity methodology, factor structures, test properties etc. I’m rambling at this point but two recently developed psychometrics, Talent Q and Wave are akin to Good.co in the sense that they also combine similar output and reporting information – the ‘Swiss Army Knives’ of psychometrics, if you will. As a last thought, there’s usually a lot of nuances to testing and psychometrics and one typically has to dig a little deeper than most websites allow in order to really understand the science and approach in question. Here’s the 4G research summary by way of contrast, but it’s fairly dry and technical (not to mention the design!). Out of interest, are you familiar with Good.co at all, or have you just found their site? I just read about the site, and now have a code to try it, which I will do and write about this week.